DM Metalloys Pvt. Ltd. is prominent supplier, manufacture and exporter of No. 8 polish in 304/304l/316/316l coils. It is defined as buffed to a mirror-like appearance but very fine enhancing lines are still visible. A Super No. 8 gleaming to a true mirror polish. Applications range from ornamental panels to bathroom mirrors. It is the most reflective surface, which is obtained by polishing with consecutively finer abrasives and buffing extensively until all grit lines from initial grinding operations are removed. 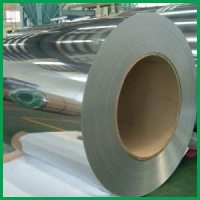 It is used for applications such as mirrors and reflectors. We basically provide various amenities to our clients. DM Metalloys Pvt. Ltd. Supplies Stainless Steel 304/304L/316/316L No.8 Finish Coils in Faridabad, Gurgaon, Gurugram, Gaziabad, Noida, Lukhnow, Delhi, Delhi NCR, Ludhiana, Amritsar, Chandigarh, Jalandhar, Baddi, Punjab, Uttar Pradesh, Haryana, Mumbai, Pune, Sahibabad, Meerut, Manesar, Bhiwadi, Bawal, Neemrana, SIDCUL, Sonepat, Ambala, Mohali, Panchkula, Kapurthala, Bareli, Kanpur.